The Spring 2015 session of art glass classes at Delphi's Creativity Center in Lansing, MI is all set to start. This season renowned glass artists Cathy Claycomb and Margaret Zinser join Tim Drier and Carol Shelkin to help expand the scope of your glassworking skills. 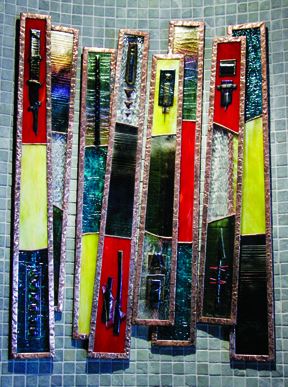 Carol Shelkin creates contemporary fine art and intricate mosaic designs that feature eminent care and attention to detail using hand-cut, high-quality stained glass. 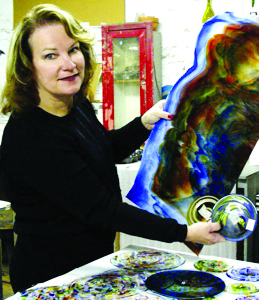 Her life-long passion for art has been honed through studies at the Pennsylvania Academy of Fine Art and under the tutelage of mosaic masters in Italy. Her one-of-a-kind works can be found in galleries, community centers, libraries and private collections. Explore Carol's work on our Pinterest board or on her website. 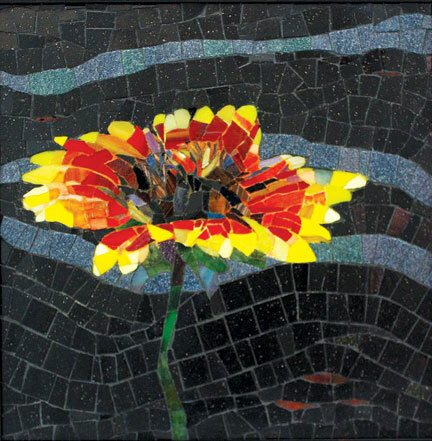 This is a hands-on workshop using modern mosaic techniques to understand realism in design, composition and color theory including; structure, cross contour, highlights, gradation, value and types of shadows using high quality Stained Glass. Learn to make decisions about your personal artwork to create realism in mosaic. Attention will be given to contemporary andamento to develop modern design. Instruction will be given to aid you in learning to evaluate your own work and help you to the next level of creativity. You will start to conquer your creative obstacles. There will be plenty of one-to-one and group instruction. No question will go unanswered, so bring questions! Level: From intermediate and advanced to first-time students in mosaic realism. Instant gratification! 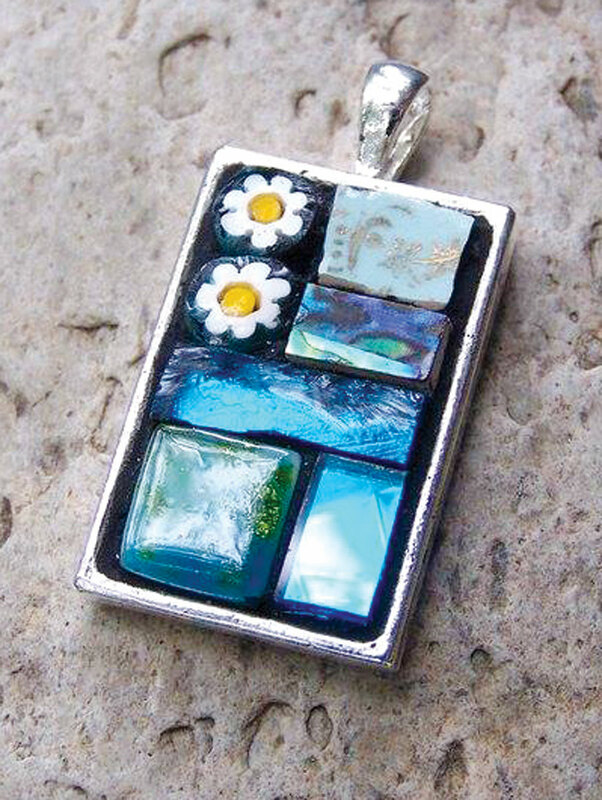 Create two unique mosaic jewelry pieces utilizing Delphis well-appointed stock of millefiori, gems, beads, dichroic glass, stained glass, smalti an overabundance of embellishments. In this evening workshop you can create the kind of mosaic jewelry offered in magazines and jewelry stores. This is an enjoyable and fun opportunity to create something unique and special for yourself or to give as a gift. Bring a friend! All Levels; no experience necessary. 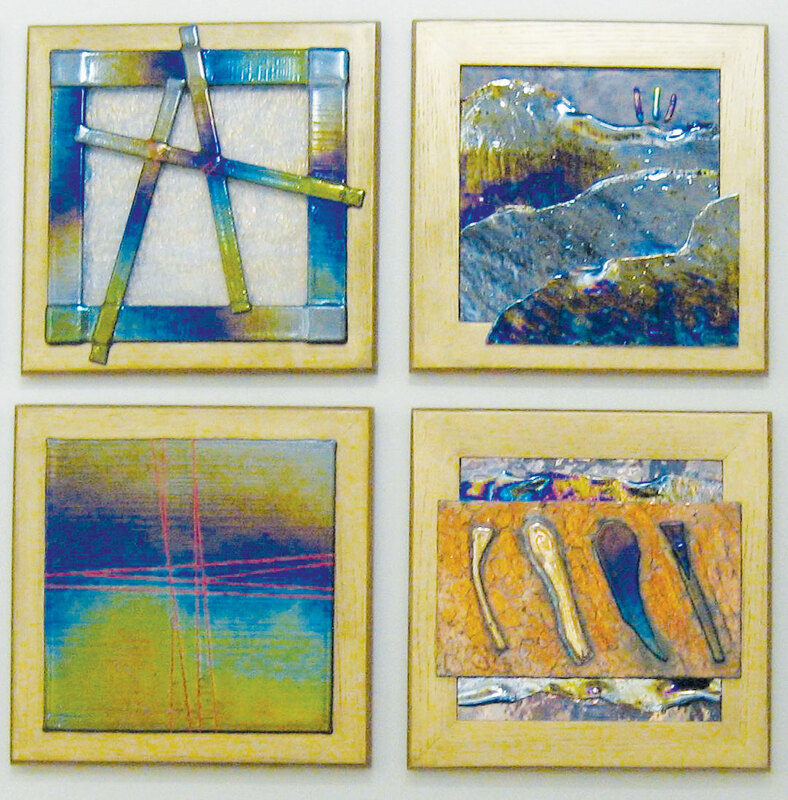 Nationally recognized for her self-developed copper foil-overlay techniques, Cathy developed her unique style of copper foil sculpture in an effort to bring more realism to her stained glass work. Her art is in galleries and private collections in the U.S. and abroad. She has been featured in multiple glass industry magazines, and is the author of a video that describes her copper foil overlay soldering techniques. 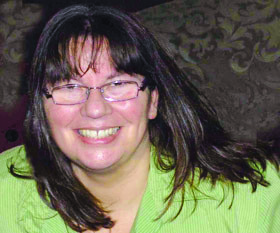 She lectures and teaches a variety of classes across the country. Enjoy Cathy's style and expertise on our Pinterest board or on her website. Going inside out with new techniques for panels and cabinet fronts. Do you love the open sided concept to stained glass? Lets turn that on its head and work new designs for open insided work! Bring a contemporary, state of the art, fresh look into your home or that of your clients. Learn the engineering behind this new INSIDE OUT approach to your stained glass. Learn fitting, locking, layering and attachment secrets to give your work a totally different look. Work a stained glass masterpiece without foiling or leading! Start by gilding oak to showcase your glass design. Multiple layers of glass will be chosen for its peculiarities, its special qualities and its texture rather than for its light transparency. Work with cold fusion and Just Make Glass without the constraints of lead, solder, or flux! 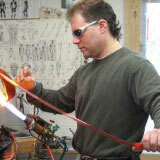 Sharpen cutting skills as you begin to think of glass as a sculptural art object rather than a color component. After this class you may never make just a glass panel again! 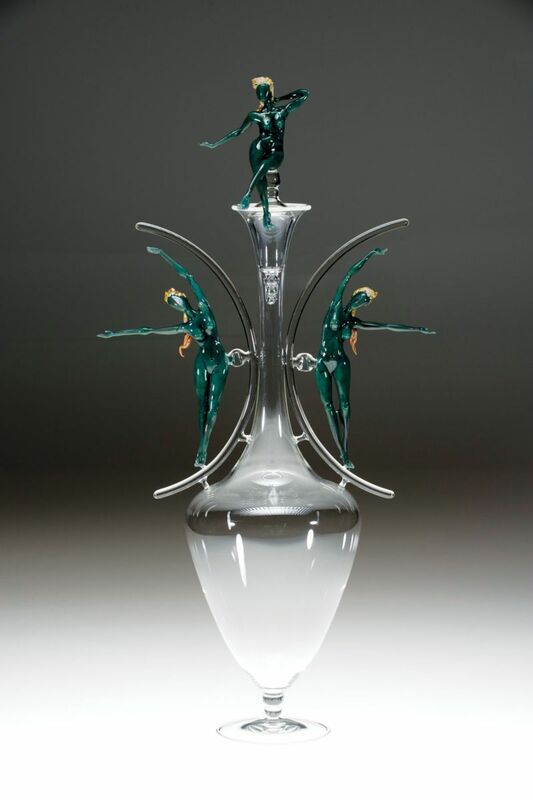 Margaret Zinser has been flameworking since 2001. Her work has been featured inthe Flow,Bead Button, Step By Step Beads, Bead Unique, and in galleries in the U.S., Canada, and Japan. She teaches group classes in studios nationwide and abroad, and private classes in her studio in Tucson, Arizona. 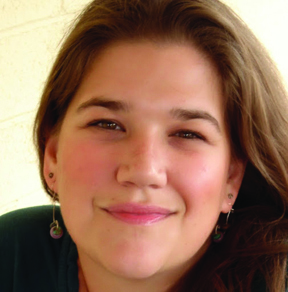 A strong advocate of arts in the community, Margaret volunteers on the Board of Directors of two Tucson non-profits:Sonoran Glass School andBeads of Courage. Explore her work on our Pinterest board or her website. Oh, the fun well have in this fast paced, one day workshop! 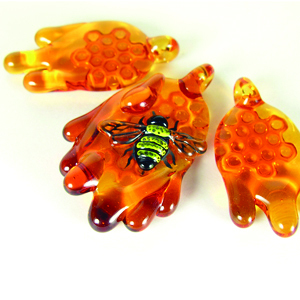 Margaret will guide students through her strategies for sculpting nature-inspired beads and pendants out of soft glass. Many insect-themes are sure to be covered, but if bugs arent your thing, Margaret will help you adapt the relief sculpting techniques she uses to your own repertoire and artistic content. Well work both on and off mandrel, using sculpting and flameworking techniques to create neat details on our flameworked jewelry! Leaves and other foliage, caterpillars, butterflies, ladybugs, and so many more fun designs will be included. This workshop is for intermediate (or advanced) beadmakers wanting to learn how to add another dimension of detail to their work. 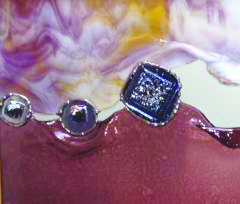 Margaret will guide students through the essentials for adding surface detail with vitreous enamel paints, including providing lessons on proper safety and handling of glass powders and enamels. 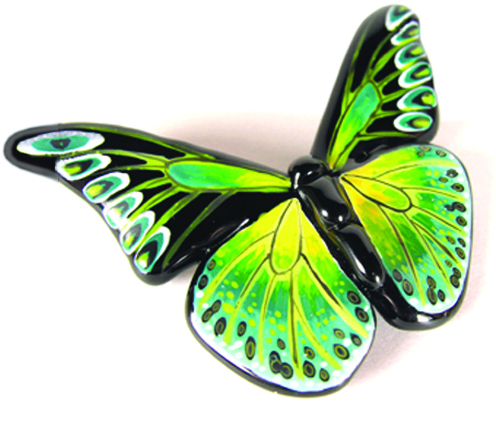 Students will leave class understanding how to properly mix enamel for various applications; how to apply enamel paint to beads; how to correct mistakes; and how to fire finished pieces. Margaret will also share with students her techniques for sculpting shaping tools to create detailed beads and pendants. An enthusiasm for insects not required! If bugs arent content that interests you, Margaret will help you translate your own designs using techniques covered in class. Techniques for sculpting, painting, and firing work made without a mandrel (AKA the beadmakers security blanket) will also be included in class. Get ready for this fast paced and FUN workshop! @undcar we offer classes all year around and we offer many classes geared toward fusers. You can look at out complete spring class schedule at http://www.delphiglass.com/page/workshops_main. @tjfoster summer classes will start trickling into the schedule from here on but the full summer schedule should be available by the beginning of May. I would be interested in summer courses, too. When will they be posted? This is the first time I have seen these classes. Do you have them in the summer? I see nothing for we kiln people. Is there something coming?